WHEN I start a project I can get a bit carried away (ok, obsessed), and the latest thing to take over my life is the new nursery. Stew laughed at me a couple of weeks ago when I said I couldn’t sleep because I was trying to plan the room. I can’t help it. I love being creative and coming up with different colour schemes and themes, and of course designing a new room means doing a bit of shopping, which I’d never say no to! I’ve been torn between a few different ideas for the nursery now that Santi is in his new room, so thought I’d share a few of them in case anyone else is looking for inspiration. Just for info, we’ve repainted the pale green walls yellow (how cliche) – but did have a bit of a shock when ‘Sunrise’ turned out to be less pastel and more staring directly into the midday sun kind of bright. Oh well, we’ll have to see how it looks when everything is in place. I think this is super cute and definitely unisex. I’ve tried to stick to a pastel and grey colour scheme which would be nice and calming. 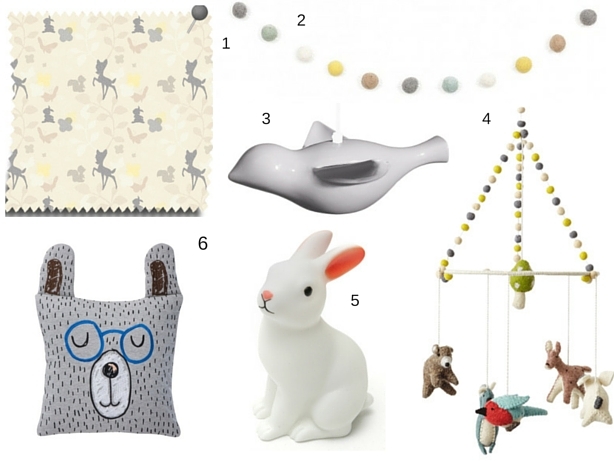 I’m in love with the bird lightshade – I kind of want one for our bedroom now – and couldn’t resist the rabbit lamp, which is a complete bargain! As the nursery is at the back of the house, it tends to get the sun in the evening, which isn’t ideal when you’re trying to put a little one to bed. Blackout blinds are a must, and when I spotted this Bambi print rollerblind from VELUX I had to include it. 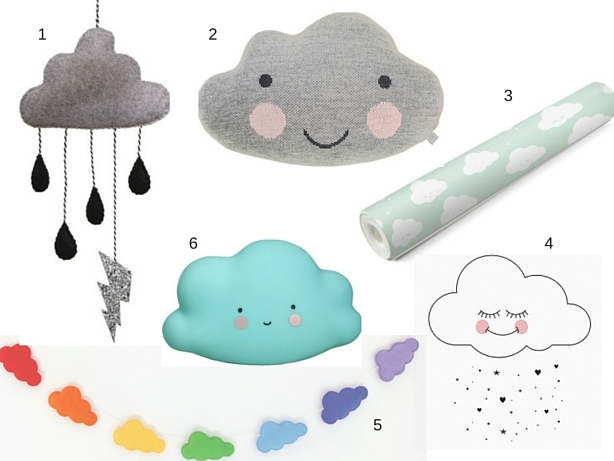 1.Storm cloud mobile, £15, Velveteen Babies; 2. Kokoko cloud cushion, £40, Bobby Rabbit; 3. Mint cloud wallpaper, 22.50 euros per roll, Eef Lillemor; 4. Sweet cloud postcard, 1.75 euros, Eef Lillemor; 5. Cloud garland, £17.89, packetcadeau on Etsy; 6. Mini cloud light, 12.95 euros, A Little Lovely Company. You’d think with the mostly gloomy Welsh weather a cloud theme would be far from appealing, but I think there’s something really sweet about smiley clouds. This can be as neutral or as bright as you choose, as you can see from the range of white, grey and coloured items. You could also expand the theme to include rainbows, raindrops or anything weather-related! 1.Baby blanket, $80, Spearmint Love; 2. Watermelon shelf, £19, A Little Lovely Company; 3. Mint apple lamp, £8, A Little Bit Milo; 4. Strawberry wall clock, £4, Tiger Stores; 5. Pear cushion, £16.50, Retro Kids. Finally, I’ve gone for a fruity theme because it it bright and summery, which feels perfect for a June baby. 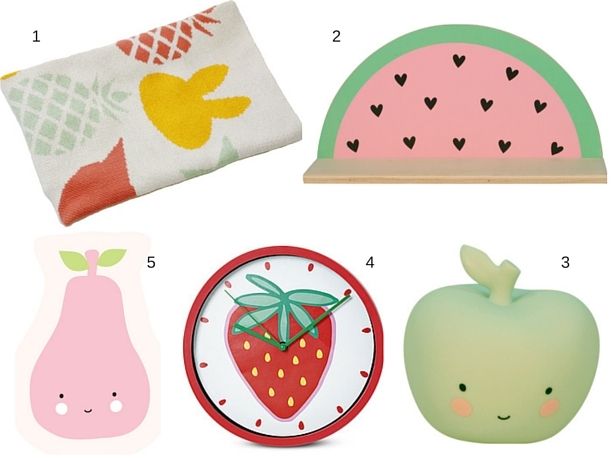 There are so many fruit-themed accessories around at the moment that it would be easy to keep the room nice and simple with some splashes of colour. If you have plain walls you could liven them up a bit with some fruity decals – I’ve seen some really cute pineapple designs around. This one probably is a bit more girly than the other two themes, but I’m feeling the pastel vibe at the moment! *What do you think of these themes? Do you have a favourite? Let me know in the comments below or leave me a message on Facebook. ← 36 and 37 week pregnancy update: Baby showers and the end of work!